This show was curious not only in its subject—death is not a common theme in contemporary art—but also in its process of coming into being. I might have been skeptical, but it works. The show is coherent and even moving. 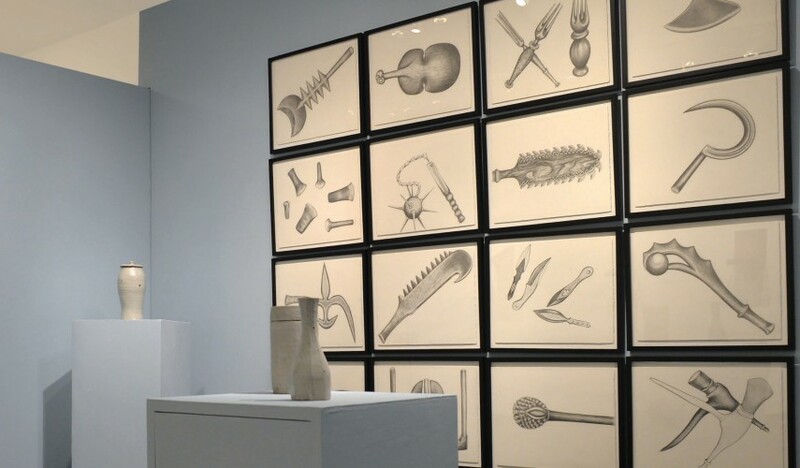 It all began with gallery owner Rebecca Cross’s own drawings of medieval weapons, which were presented in the exhibition as a grid of 16 graphite-on-watercolor-paper works on one wall of the small gallery. She chose clubs, knives, flails and more, all implicitly painful forms. Although their brutality is moderated by the serenity of monochrome and by the sensuousness of the rendering, the message is one of effective punishment that would not be nearly so clean in practice as these drawings are in execution. They hang on the wall like bad dreams, disturbingly seductive.